I love this picture for reasons other than the humor. The house raven feels comfortable perching on the scarecrow. The wash raven doesn’t. That suggests that the dang things learn. And if they can learn one thing, they can learn another. 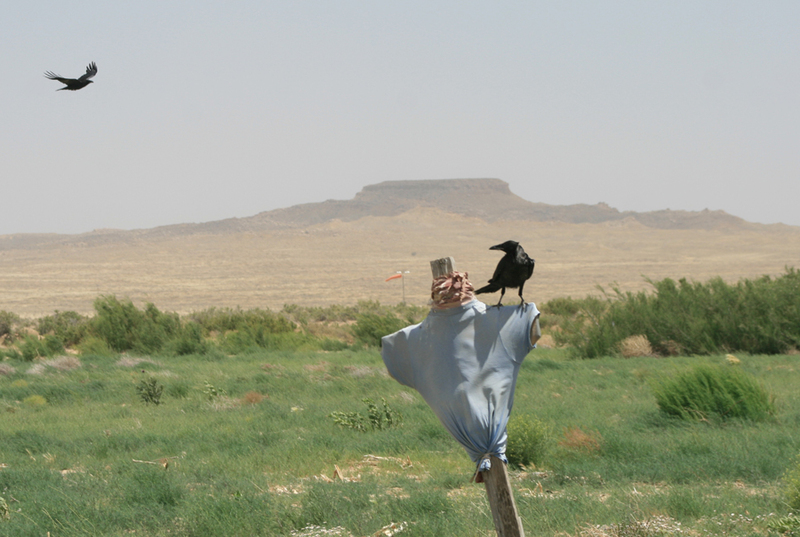 A wash raven has learned to fear and distrust the human form and so it steers clear of it. The house raven, though, has grown up perching on our shoulders. It associates those shoulders with sustenance. To perch on a shoulder is no biggy. The wash raven and the house raven probably consider one another deranged. But what if farmer and animal got to know one another? More, meet Lloyd. Lloyd, this is More. As for the farmer (I’m talking to you, Lloyd), behavior is malleable. In what way can we encourage good behavior? Is it possible to both preserve the corn and coexist?